The American Flag is one of the most easily recognized in the world. Also known as "Old Glory," and "The Stars and Stripes," it is a symbol of national pride to Americans. As such, it should be treated with a high degree of respect at all times. To ensure that this occurs, there are standards, or rules, that people are expected to follow. These standards instruct the public and military on how the flag should not only be handled, but also how it should be displayed and disposed of. This Code is known as the United States Flag Code and it is a Federal law. Whenever a person handles or otherwise deals with the U.S. flag, it is important that he or she understands the proper etiquette associated with their actions. The U.S. Flag Code outlining the laws regarding the flag was first put into effect during World War II. It was originally outlined in 1923 by the American Legion and other organizations. Although it is made up of laws, a person generally cannot be prosecuted for breaking them. This is primarily due to a person's right to free speech. Several notable cases have tested this, however. One of the most prominent cases occurred in 1984, during the Republican National Convention. During the Convention, which took place in Dallas, Texas, an American Flag was burned during a protest by a man named Gregory Johnson. This act defied a Texas law that states no flag of state or national origin may be desecrated. Johnson was prosecuted for the burning and found guilty. In 1989 the judgment was overruled by the U.S. Supreme Court on the basis that Johnson's First Amendment rights were being violated by the decision. In protest of this decision, Congress made an attempt to pass a law that would make it illegal to desecrate an American flag. Known as the Flag Protection Act of 1989, it was also found to be a violation of one's right to free speech. The Flag Code governs nearly all aspects involving the flag, including when and how it is flown. Traditionally government buildings should take down the flag at night, and raise it from sunrise to sunset; however the Code also states that it may be flown 24 hours a day if given the proper lighting. The flag may be flown at half-staff during certain days of mourning in order to show respect and honor the memory of those deceased. This may occur when certain current or former officials pass away. The President of the United States may also order this when a notable citizen, such as Martin Luther King, dies. It is also flown at half-staff until noon on Memorial Day. Both on Patriot Day and Pearl Harbor Remembrance Day the national flag is flown at half-staff. 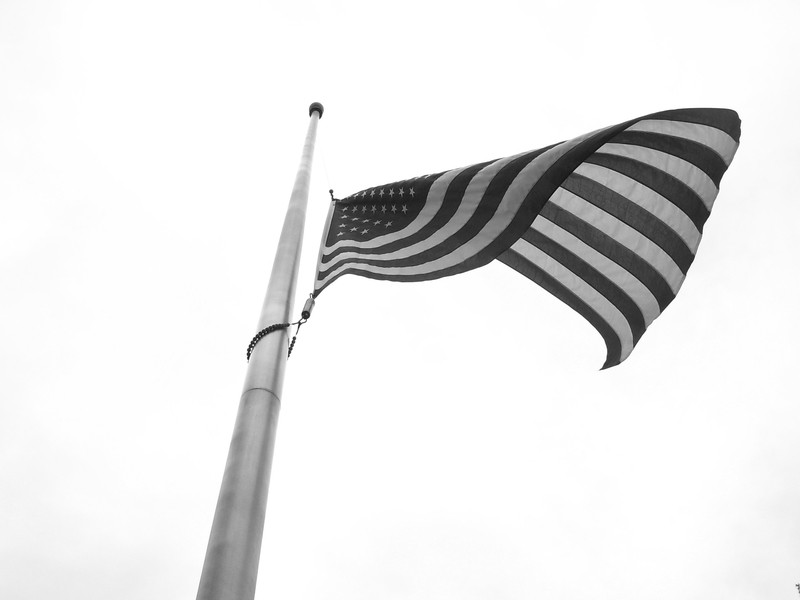 You can find further details about half-staff dates and flag rules here. The military must follow certain additional etiquette requirements when dealing with the flag. During the national anthem or during ceremonies in which the flag is present, military personnel must perform a military salute while in uniform. People are also allowed to perform a military salute even when they are not in uniform. Military personnel are also authorized to wear a permanent flag patch on their uniforms. It must be sewn on the right shoulder seam. Because it is on the right sleeve the flag is worn in reverse, or backward. This is done to give it the appearance of "blowing in the breeze" when the service person is in motion. When a church or other religious organizations displays the flag, it must be on a staff and situated to the right of any other flags and to the right of the man or woman giving the sermon. Flags may also be used during the burial of servicemen and women. The appropriate way to drape the flag over the casket is to place it so that the portion of the flag with the union, or stars, is placed over the deceased head and left shoulder. It is removed from the casket prior to burial. The flag is then symbolically folded in what is known as a 13-fold ceremony by the honor guard and presented to and accepted by the family of the deceased. Over time one's flag may become dirty, torn, or otherwise damaged. 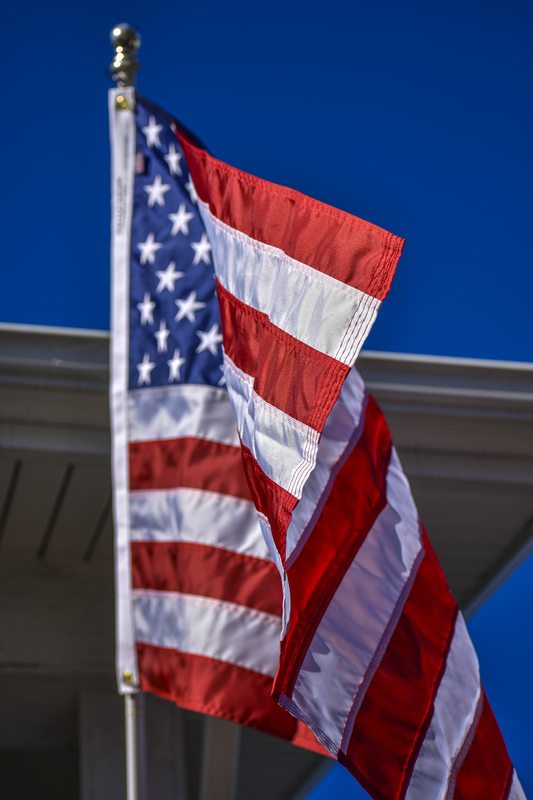 A dirty outdoor American flag may be cleaned from time to time with mild detergent before it is rinsed completely. To care for an indoor flag, the services of a reputable dry cleaner is recommended. If the flag is damaged, consider the location and whether the damage can be mended. If it is possible to mend the damage, and it is in a location that will not be visible when the flag is flown, then it is acceptable to make the repair. If the damage to the flag is extreme and in a location where it would be impossible to hide the repairs, it is best to discard the flag in favor of a new one. The American Flag should never be thrown away when it is damaged beyond repair. Instead the recommendation is to destroy or discard it in a way that is dignified and worthy of its importance. The preferred way to destroy a ruined flag is by fire. The fire, however, must be hot enough to completely burn the flag, which should be appropriately folded prior to being placed in the flames. This, however, may not be safe or even legal depending on where a person lives. Another acceptable solution is to take the flag to the local Veterans of Foreign Wars (VFW) post, which will accept and properly dispose of the flag. You can learn more about options for retiring and disposing of American flags properly here. The American Flag is universally recognized as a symbol of strength and pride. Because of this, U.S. citizens will want to care for and display it in a way that reflects its importance. This is done by treating it with respect and care. By understanding and following the laws associated with flying the national flag, people can show their pride in their country.